Welcome to the listing page of Kona Plaza#220! 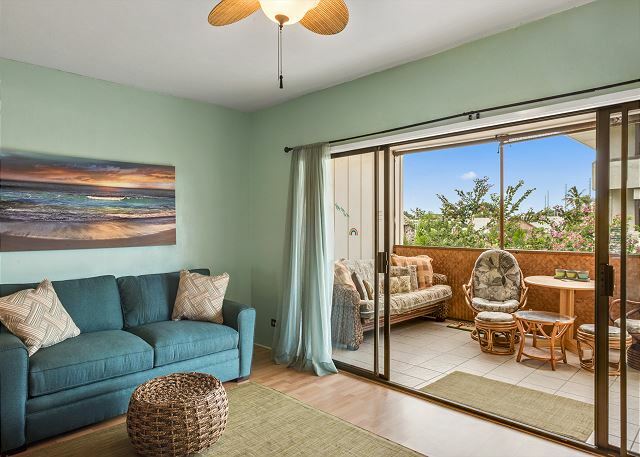 It's amazing location puts you right in immediate walking distance to restaurants, beaches, shopping & entertainment right in the heart of Kailua Village. This comfortable 1 bedroom, 1 bath that sleeps 4 features a King Sized Bed & a BRAND NEW SLEEPER SOFA in the living room (The owners thank you for your feedback! ), Central Air Conditioning, Wifi Access, Washer/Dryer, Fully Equipped Kitchen, Elevator Access & Underground covered parking! There is a big screened in lanai/balcony with sun shades for additional living space. 43 inch tv in living room!! Kona Plaza Condominium Complex has a great pool with lounge chairs, & 2 BBQ decks with great views of the ocean/mountain. WHAT A DEAL! LOOK AT ALL OF THESE RESTAURANTS IN WALKING DISTANCE INCLUDING: Pancho & Lefty's, Fosters Kitchen, Splashers Grill, The Fish Hopper, Huggo's and Huggo's on the Rocks, Don the Beachcomber, Kona Inn Restaurant, Mahina Pizza, Kona Canoe Club, Outback Steakhouse, Bubba Gump Shrimp Co, Island Lava Java, Bongo Bens Island Cafe. MANY MORE!! The Kailua Bay pier is a short 5-minute walk, from which most of the boat excursions on the Big Island's west coast depart (snorkel, whale watch, dinner cruise). Safeway grocery, Longs drugstore(CVS), gas stations, Costco, and Target are a short drive away. Knutson & Associates Property Management is newly representing this property as a brand new Vacation Rental! Be one of the first guests to enjoy this very well priced property! We had a wonderful stay in your condo. It has everything you could need for cooking, dining and beach time. Upon our arrival there was remodeling going on in the condo directly above our unit. We were not pleased that we were not notified prior to arrival but after the first day it was extremely quiet. We had an issue with the hot water heater leaking and the management company responded the same day but we were without hot water for that evening(glad I had already showered). They replaced the water heater the following day and things were back to normal. Having central AC was great. The condo stays very cool and we did not have to run it often. Overall we had a great stay and would stay here again. A wonderful home and experience away from home. Kudos to Ashly Gonsalves for making sure everything was perfect and any problems were promptly taken care of, a valuable asset for Knutson and Associates. 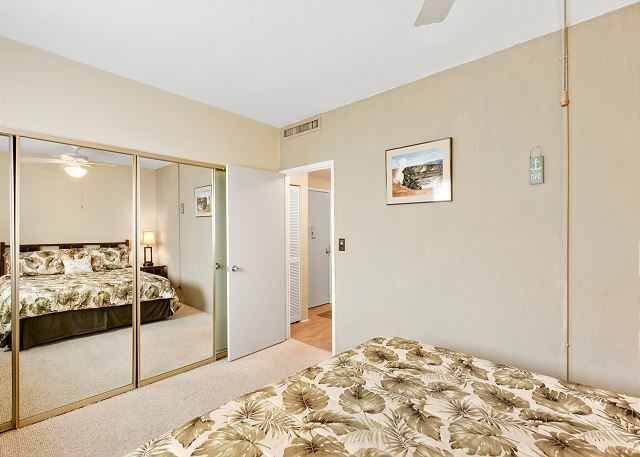 The condo was very clean and well appointed, the complex was kept immaculate from the underground secured parking and all public access areas. The kitchen had everything from dish washer, laundry facilities, large screened lanai,and a fine array of all kitchen gadgets for all requirements. Nice BBQ areas with water and downtown views, also well kept swimming pool with water toys provided.YES, I would definitely come again, and I will recommend this to anybody!!! I enjoyed visiting and snorkeling at many beach areas, eating pizza at Kona brewery, fantastic Thai restraunts, and shopping and Hawaiian feasts. A quiet community that is within walking distance to all the shops and activities. Relax in the room. Action on Ali'i Drive just a few steps away. Walking distance to Alii Drive, (half a block), above Pancho & Lefty’s Mexican food👍. Walking distance to all shops & restaurants on Alii. Walk to King Kam beach. Great enclosed lanai. No fault of condo owner or management but parking lot was getting resurfaced. Off season. This would be a five star if bedroom would have darker curtains and better directions on some of the appliances. Other than that, beach gear taken care of. Condo is a good place to regroup between your Hawaii adventures! Aloha, thank you so much for all your input. We're so sorry you were inconvenienced by the parking lot, and have gone ahead and decided to install black out curtains. Clarified instruction for those appliances are in process, and we are making every effort possible to coordinate with the property owner to improve experiences, and appreciate your insight. We hope to have you stay with us again on the Big Island. Mahalo! We loved our stay here! 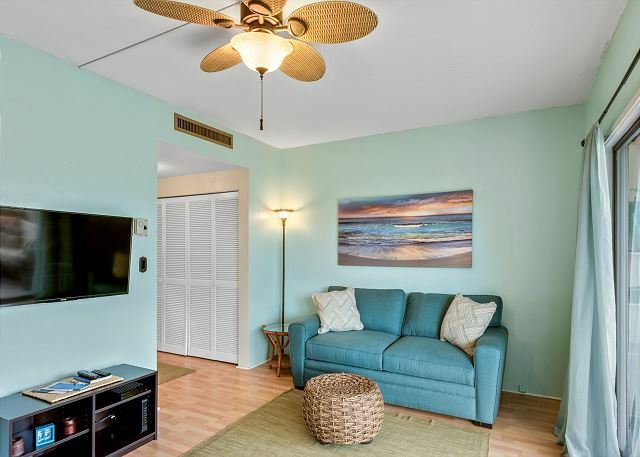 This condo is nicely situated in the downtown area, close to great restaurants, shops and the pier. There are a few smaller beaches within walking distance of the condo. The property manager is very friendly and easy to deal with. Both the master bed and the fold out bed are comfy. Our two year old’s favourite part of the condo was the spacious lanai overlooking the grounds of the oldest church on the island. We ate nearly every meal out there so we could soak up the lovely warmth and scents of Hawaii. Only a few blocks from the beach and Gertrude's jazz bar. I enjoyed my stay. We stayed here for 3 weeks and were sad to leave. The building is older which is a good thing as the concrete structure makes it very quiet. It has an elevator, secured underground parking, central AC and a screened in Linai. We didn’t use the dining room table once as we ate all our meals on the large Linai. The king size bed is very comfortable as were the pillows. Their is a large sofa on the Linai suitable for single sleeping. The pull couch is okay in the living room, a little unfortable to sit on. The smart TV enables you to use your nexfix account. 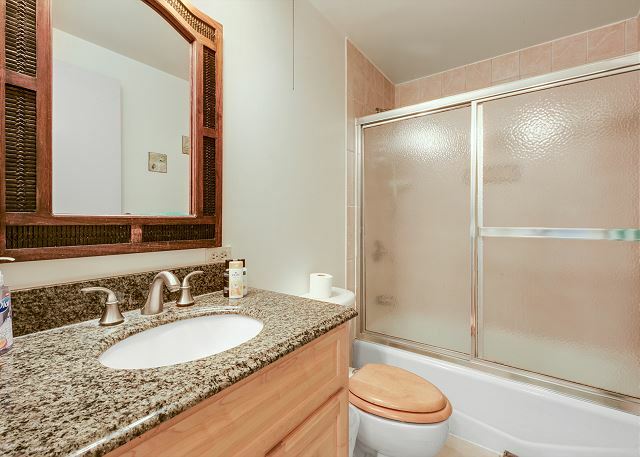 The location is excellent, steps away from the downtown core amenities. Five minute walk to the pier, which has a nice beach where the Ironman race is located and another beach with a grassy area in front of the Marriott hotel. The condo has lawn chairs, a nice cooler bag and sun umbrella. The other condo owners in the building were nice and were very positive. The condo is decorated beautifully. The negative, the bedroom window lets in too much light. A room darkening blind would be nice. First time entering the condo after a long flight, a little confusion as there is a lockbox on the wall and another on the door handle. Quiet rooms despite downtown location. New futon was comfortable & kitchen has everything you need. Building had A/C problems during our stay which was quite unfortunate. Property manager was reasonable to deal with. Overall we enjoyed our stay and would rent there again. This condo was everything we needed for our 4 days in Kona. 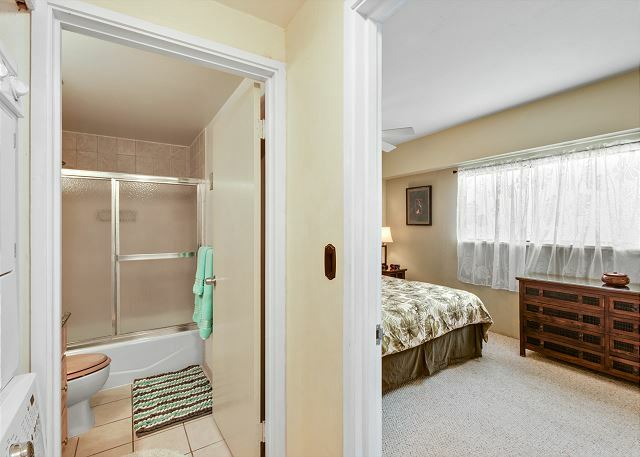 The Unit was very clean and equipped with everything and parking was included. It is centrally located and walking distance to shops and restaurants. The property management is very helpful and friendly. The only problem we had was with the folding sofa. It was not very comfortable as it was very deep and folds into an awkward sitting position. Other than that I would definitely stay here again.